Abstract: Acute kidney injury (AKI) is characterized by a sudden renal dysfunction with consequent increase of nitrogenous products, hydroelectrolytic and acid–base disorders. Its prevalence is high in hospitalized populations (4.9%–7.2%), especially in intensive care units (ICUs). Despite all the technical and therapeutic advances that have occurred in the last few decades, the overall mortality of AKI patients remains high, reaching 80% in ICU patients. Several conditions predispose a patient to progress with AKI, including age, sepsis, surgeries, and comorbidities, such as systemic arterial hypertension, diabetes mellitus, heart disease, neoplasia, and chronic renal disease. Among these risk factors, age is emphasized, since, due to advances in the health area, there has been an increase in life expectancy, hence an increase in the demand of the elderly population for health services. At the same time, the elderly present a greater predisposition to the development of AKI, either due to kidney senility, or because of the high prevalence of comorbidities present, and medical interventions such as the use of contrasts and medications, which can also trigger AKI. Considering the relevance of the social role of the elderly and the scarcity of studies on AKI in the elderly admitted to the ICU, further studies are needed. This review article was elaborated considering the purpose: to assess incidence, risk factors, and mortality of AKI in elderly patients admitted to ICUs. Published studies were collected using the following inclusion criteria: be accessible in online databases (Lilacs, Scielo, and PubMed), have been published since 2000 and written in English, Portuguese, or Spanish. The descriptors used for the survey were “Acute Kidney Injury”, “Aging”, and “Elderly”. All items that did not fit in the above inclusion criteria were discarded. We have also presented a synthesis of the knowledge acquired during this review. Acute kidney injury (AKI) is characterized by a sudden renal function impairment followed by electrolyte and acid–base balance disorders as well as an increase in nitrogen products.1,2 The prevalence of AKI is shown higher in hospitalized populations (4.9%–7.2%), especially in patients admitted to the intensive care unit (ICU; 40%),3 when compared with the community (0.4%–0.9%). The KDIGO criteria, besides defining AKI, also classify it into stages, as shown in Table 1. Abbreviation: KDIGO, Kidney Disease: Improving Global Outcomes. AKI can also be classified according to its pathophysiology. It may be caused by three main mechanisms: low renal perfusion, renal parenchymal injury, and excretory system obstruction, leading respectively to prerenal, renal, and postrenal AKI, as shown in Figure 1. Figure 1 AKI classification according to its pathophysiology. Abbreviation: AKI, acute kidney injury. The prerenal or “functional” AKI is defined as an accumulation of nitrogenous products secondary to renal plasma flow and glomerular filtration rate (GFR) reduction. It is the most common form of AKI (40%–60%)7 and is reversible when its basic causes are treated. The main causes of prerenal AKI are as follows: absolute volume reduction (hemorrhage and volume depletion), relative volume reduction (cirrhosis and heart failure [HF] – also known as cardiorenal syndrome [CRS]), and hypoperfusion (by shock or medication). It can be noted that data on the most prevalent type of AKI are conflicting; therefore, further studies to clarify this epidemiology are necessary. 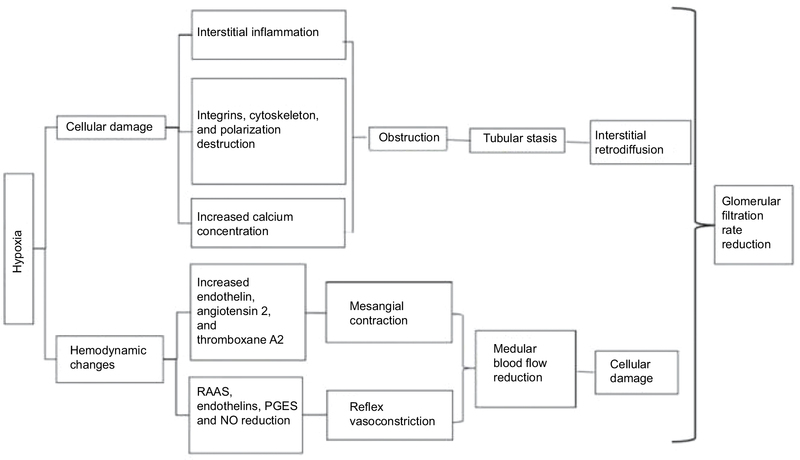 The ischemic AKI’s pathophysiology is complex because it involves hemodynamic, oxidative stress, and inflammatory mechanisms, as shown in Figure 2. Figure 2 Ischemic AKI’s pathophysiology. Abbreviations: AKI, acute kidney injury; NO, nitric oxide; PGES, prostaglandins; RAAS, renin–angiotensin–aldosterone system. Several factors can predispose a patient to AKI. Among them, the most highlighted ones are age, sepsis, surgery, prolonged hospital stay, and presence of comorbidities such as hypertension (HT), diabetes mellitus (DM), heart disease, chronic kidney disease (CKD), and liver diseases. Bucuvic et al3 identified in their research that 62% of patients diagnosed with AKI were male, 65.2% were >60 years, 61.9% had DM, 44.4% were hypertensive, and 21.9% had CKD. Oweis and Alshelleh5 reported that 62% of ICU patients with AKI were male, 51.5% were >60 years, 57.7% of patients had HT, 27.4% had heart disease, and 26.6% had DM. Junior et al12 showed in their work that 62% of patients with AKI in ICU were men, 48.4% of AKI was caused by hypotension, 40.6% by sepsis, and 21.9% by nephrotoxic drugs. The most common comorbidities associated with the AKI are respiratory failure (28.9%), cardiovascular disease (25.8%), HT (19.5%), DM (9.4%), surgical complications (9.4%), and liver disease (7.8%). Santos and Matos15 performed a study that compared patients who acquired AKI in ICU with those who did not, and showed that patients affected by AKI were older (56.4±18.8 vs 46.8±16.5 years, P=0.0028); had more septic shock (19.2% vs 6.5%, P<0.05), and sepsis (17.3% vs 3.9%, P=0.012). Pedersen et al13 found that 36% of patients with AKI in ICU were >70 years, 65% were male, 51% were in the postoperative period, 28% developed ischemic AKI, 31% had AKI associated with sepsis, 35% were nephrotoxic, and 7.7% had an obstructive cause. It is important to point out that among elderly population the most frequent causes of AKI were nephrotoxicity and obstruction of the urogenital system. Thus, it can be observed that there is a convergence in terms of risk factors for AKI with emphasis on elderly patients admitted to ICUs, comorbidities such as HT and DM, presence of sepsis, and previous surgery. Considering the high incidence of AKI in the elderly and the social role of the elderly, we can conclude that more AKI studies in the elderly are necessary. Although there is no uniformity in the epidemiology of AKI in the elderly due to changes in diagnostic criteria used by different authors as well as population variations between different areas, all studies converge on the high incidence and mortality of AKI in elderly patients. The risk factors that make the elderly prone to develop AKI can be divided into three types: 1) related to kidney senility, 2) secondary to the elderly’s comorbidities, and 3) associated with medical intervention,13,16,17 as shown in Figure 3. 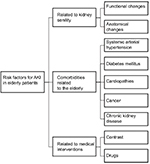 Figure 3 Risk factors for acute kidney injury in elderly patients. The kidneys, as well as the rest of the body, get old, and in the aging process, atrophy and cease to perform their basic functions. It involves glomerulosclerosis, tubular atrophy, interstitial fibrosis, and atherosclerosis, thus defining senile nephrosclerosis. This kidney senility can be characterized by morphological, anatomical, and functional changes that ultimately lead to lower performance of the filtration process, therefore, facilitating the installation of AKI and consequent azotemia or even uremic syndrome. With age, there is also an increase in the kidney’s cellular apoptosis rate, leading to a lower number of functional nephrons, thus contributing to a reduction in GFR and creatinine clearance ratio, which induces a decrease in renal functional reserve, making the kidney more susceptible to AKI.16,17,21,22 The reduction in the number of nephrons also leads to an impairment of the sodium retention mechanism16 leading to changes in urine concentration as well as a larger volume depletion and urine dilution, which can cause dehydration. This loss of nephrons also means that there is an increase filtration load, which induces a nephron hyperfiltration injury. At the same time, flaws in the acidification mechanism during physiological stress lead to metabolic acidosis and decreased production of renal 1-alphahydroxylase, which induces alterations in calcium metabolism and may trigger renal osteoporosis. Several common comorbidities may make the elderly prone to AKI. Among them, the presence of HT, DM, heart disease, and CKD stand out, according to most studies. By the same mechanism of endothelial injury, hypertension also leads to the formation of atheromatous plaques that reduce the renal blood supply by decreasing the vessel lumen and damaging the self-regulatory mechanisms of the renin–angiotensin–aldosterone system (RAAS). This way, aged people’s RAAS may be reduced by 30%–50% when compared with the younger population.16 In order to have a negative feedback by RAAS in response to the decline of renal perfusion, the arteries must be elastic and in proper condition for vasoconstriction (efferent) and vasodilation (afferent), which may not occur in the elderly due to atheromatous plaques that decrease both the arterial lumen and elasticity of vessels, thereby complicating the vasodilatation and vasoconstriction response to ischemic insults and facilitating the occurrence of a prerenal AKI. Cancer, which is more and more frequent with advancing age, presents as an important risk factor, either because of the presence of tumors capable of obstructing the urinary tract, or because of the need for chemotherapy for its treatment, which can become nephrotoxic. In addition, it can increase the production of inflammatory cytokines,16 which may also predispose to AKI as cytokines play an important role in AKI’s physiopathology. The elderly are usually submitted to a large number of tests for which the use of nephrotoxic contrast is necessary. The radiographic contrast, in addition to direct tubular damage, alters renal perfusion and intrarenal hemodynamics. Although short-term mortality rates identified by different researchers may vary, they all agree that the mortality of elderly patients with AKI is high and may be higher than in other age groups. Most studies of elderly ICU patients with AKI indicate mortality rates around 63.5% reaching up to 76.2%, as described by Mataloun et al.11 Pedersen et al13 identified a mortality rate of 53.1% in their study, similar to Mårtensson et al23 who reported a mortality of 50%. There are few studies that keep tracking the elderly and assess their progress in the post hospital stage.5 Coca21 reports that AKI is independently related to long-term mortality in the elderly, as about 28% of elderly patients aged >65 years did not recover renal function after an episode of AKI, developing CKD afterward because of the lack of compensatory mechanisms and adequate regeneration. Acunak et al25 reported that 18.9% of elderly patients with AKI progress to dialysis treatment and 66.7% of this population die within 1 year. Brown et al29 report that the stigma suffered by elderly dialysis patients is very large, and secondarily, their quality of life is reduced. Although there are several ways to prevent AKI, early detection of renal failure and greater attention of health professionals to recognize the elderly’s vulnerability to AKI are still the best options to reduce the complications of this syndrome and, consequently, its mortality rate. Finally, there is no consensus in the epidemiology of AKI in the elderly; all studies agree about its high incidence and mortality. 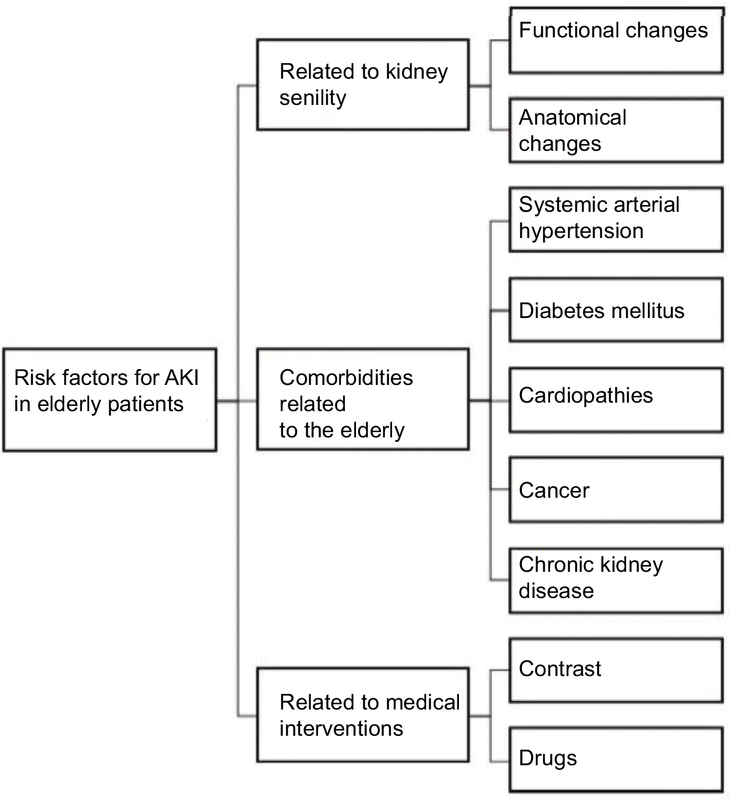 Risk factors that make the elderly likely to develop AKI are related to kidney senility, secondary to comorbidities and, associated with medical procedures. Recognizing the vulnerability of the elderly to AKI and the early diagnosis of this syndrome are the best options to reduce its high prevalence, complications, and consequently, mortality. We acknowledge and thank the following institutions for their contribution to this study: FAPESP (Sao Paulo’s State Research Support Foundation) and FMB – UNESP (Botucatu Medical School – University of Sao Paulo). Nash K, Hafeez A, Hou S. Hospital-acquired renal insufficiency. Am J Kidney Dis. 2002;39(5):930–936. Mehta RL, Chertow GM. 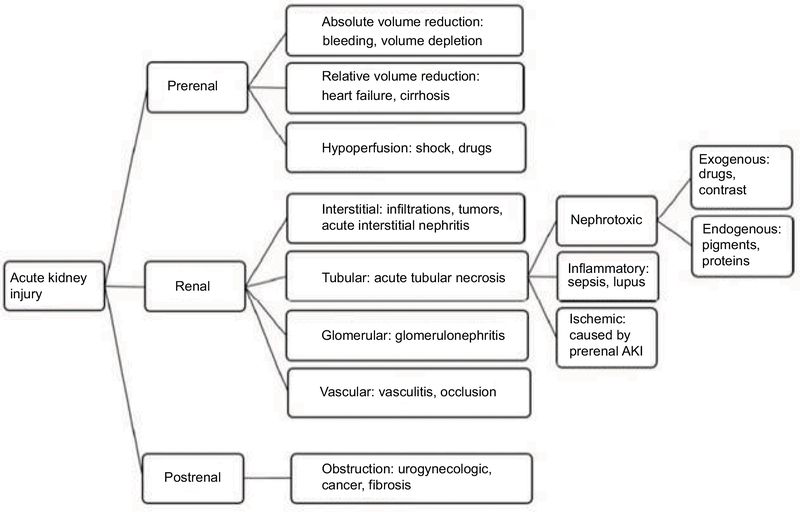 Acute renal failure definitions and classification: time for change? J Am Soc Nephrol. 2003;14(8):2178–2187. Bucuvic EM, Ponce D, Balbi AL. Risk factors for mortality in acute kidney injury. Rev Assoc Med Bras. 2011;57(2):158–163. Medeiros P, Nga HS, Menezes P, Bridi R, Balbi A, Ponce D. Acute kidney injury in septic patients admitted to emergency clinical room: risk factors and outcome. Clin Exp Nephrol. 2015;19(5):859–866. Oweis AO, Alshelleh SA. Incidence and outcomes of acute kidney injury in octogenarians in Jordan. BMC Res Notes. 2018;11(1):279. Yao HK, Omer Binan AY, Konan SD, N’Da KJ, Diopoh SP. Mortality in the elderly with acute kidney injury in an internal medicine department in Abidjan, Cote D’Ivoire. Saudi J Kidney Dis Transpl. 2018;29(2):414–421. Rosner MH, La Manna G, Ronco C. Acute Kidney Injury in the Geriatric Population. Contrib Nephrol. 2018;193:149–160. Kidney Disease: Improving Global Outcomes (KDIGO) Acute Kidney Injury Work Group. KDIGO clinical practice guideline for acute kidney injury. Kidney Int Suppl. 2012;2:1–138. Turgutalp K, Bardak S, Horoz M, Helvacı I, Demir S, Kiykim AA. Clinical outcomes of acute kidney injury developing outside the hospital in elderly. Int Urol Nephrol. 2017;49(1):113–121. Chaumont M, Pourcelet A, van Nuffelen M, Racapé J, Leeman M, Hougardy JM. Acute kidney injury in elderly patients with chronic kidney disease: do angiotensin-converting enzyme inhibitors carry a risk? J Clin Hypertens. 2016;18(6):514–521. Mataloun SE, Machado FR, Senna APR, Guimarães HP. Amaral J.L.G. Incidence, risk factors and prognostic factors of acute renal failure in patients admitted to and intensive care unit. Rev Braz Med Biol Res. 2006;39(10):1339–1347. Junior GBS, Daher EF, Mota RMS, Menezes FA. Risk factors for death among critically ill patients with acute renal failure. Rev São Paulo Med J. 2006;12(5):257–263. Pedersen AB, Gammelager H, Kahlert J, Sørensen HT, Christiansen CF. Impact of body mass index on risk of acute kidney injury and mortality in elderly patients undergoing hip fracture surgery. Osteoporos Int. 2017;28(3):1087–1097. Nga HS, Medeiros P, Menezes P, Bridi R, Balbi A, Ponce D. Sepsis and AKI in Clinical Emergency Room Patients: The Role of Urinary NGAL. Biomed Res Int. 2015;2015:413751. Santos ER, Matos JD. Perfil epidemiologico dos pacientes com injúria renal aguda em uma unidade de terapia intensiva. Arq Cat de Med. 2008;37(4):7–11. Chronopoulos A, Cruz DN, Ronco C. Hospital-acquired acute kidney injury in the elderly. Nat Rev Nephrol. 2010;6(3):141–149. Chronopoulos A, Rosner MH, Cruz DN, Ronco C. Acute kidney injury in elderly intensive care patients: a review. Intensive Care Med. 2010;36(9):1454–1464. Funk I, Seibert E, Markau S, Girndt M. Clinical course of acute kidney injury in elderly individuals above 80 years. Kidney Blood Press Res. 2016;41(6):947–955. Petronijevic Z, Selim G, Petkovska L, Georgievska-Ismail L, Spasovski G, Tozija L. The effect of treatment on short-term outcomes in elderly patients with acute kidney injury. Open Access Maced J Med Sci. 2017;5(5):635–640. Hsu RK, Siew ED. The growth of AKI: half empty or half full, it’s the size of the glass that matters. Kidney Int. 2017;92(3):550–553. Coca SG. Acute kidney injury in elderly persons. Am J Kidney Dis. 2010;56(1):122–131. Schinstock CA, Semret MH, Wagner SJ, et al. Urinalysis is more specific and urinary neutrophil gelatinase-associated lipocalin is more sensitive for early detection of acute kidney injury. Nephrol Dial Transplant. 2013;28(5):1175–1185. Mårtensson J, Bell M, Oldner A, Xu S, Venge P, Martling CR. Neutrophil gelatinase-associated lipocalin in adult septic patients with and without acute kidney injury. Intensive Care Med. 2010;36(8):1333–1340. Anderson S, Eldadah B, Halter JB, et al. Acute kidney injury in older adults. J Am Soc Nephrol. 2011;22(1):28–38. Acunak, CE, Grover A, Camelo A, Junior RS. Características clínico-epidemiológicas de adultos e idosos atendidos em unidade de terapia intensiva pública da Amazônia (Rio Branco, Acre). Rev. bras. ter. intensiva 2007;19(3):304–309. Silveira Santos CGD, Romani RF, Benvenutti R, Ribas Zahdi JO, Riella MC, Mazza do Nascimento M. Acute Kidney Injury in Elderly Population: A Prospective Observational Study. Nephron. 2018;138(2):104–112. Shih CH, Lee YJ, Chao PW, et al. Association between influenza vaccination and the reduced risk of acute kidney injury among older people: A nested case-control study. Eur J Intern Med. 2018;pii: S0953-6205(18):30174-2. Davison BA, Metra M, Cotter G, et al. Worsening Heart Failure Following Admission for Acute Heart Failure: A Pooled Analysis of the PROTECT and RELAX-AHF Studies. JACC Heart Fail. 2015;3(5):395–403. Brown MA, Collett GK, Josland EA, Foote C, Li Q, Brennan FP. CKD in elderly patients managed without dialysis: survival, symptoms, and quality of life. Clin J Am Soc Nephrol. 2015;10(2):260–268. Chao CT, Lin YF, Tsai HB, Wu VC, Ko WJ. Acute kidney injury network staging in geriatric postoperative acute kidney injury patients: shortcomings and improvements. J Am Coll Surg. 2013;217(2):240–250.